Points Nécessaires : 11750 Software is not compatible with mobile and tablet devices. Please add this title to your Wish List and sign on to your the first club account from a desktop computer to complete your redemption. NOTICE: Activation key must be used on a valid Steam account. Requires internet connection. About the gameStep into the boots of Grayson Hunt after a crash landing on an abandoned resort planet forces him to make a hard choice: survival or revenge. An exiled member of the elite assassin group Dead Echo, Grayson’s blind desire for vengeance finds his crew stranded on Stygia where he can finally… confront the commander behind his betrayal—or get his team off the planet alive.Battle your way through throngs of Stygia’s mutated inhabitants, performing masterful kills throughout the single-player campaign—or one of 30 competitive score-challenge or 12 co-operative multiplayer maps—using Bulletstorm: Full Clip Edition’s unique “Skillshot” system that rewards you for executing the most creative and deadly kills imaginable.Bulletstorm: Full Clip Edition is the definitive Bulletstorm experience that includes all existing Bulletstorm add-ons, plus brand-new content exclusive to Full Clip!Key Features The Complete Experience	Loaded with all of the original Bulletstorm and add-on experiences plus all-new content exclusive to Full Clip Edition! This definitive version brings a multi-playthrough campaign, 30 single-player Echo challenge maps, 12 co-op team-challenge maps, and more, all to your favorite modern platform	Killer Visuals and Audio	Indulge your senses with updated models, environments, animations, and a new rendering mode, all running at a smoother frame rate than ever before—with 4K resolution support on PS4 Pro and PC—and lavishly remastered audio effects	New Overkill Campaign Mode Blast your way through a cranked-up version of the campaign with an unrestricted arsenal of weapons and Skillshots New Echo Maps Showcase your skills on six brand-new levels exclusive to Full Clip Edition for the addictive score-based Echo Mode Anarchy Loves Company Level up and cash in on your kills! Earn new weapon skins, leash styles, and character customizations as you progress through the team-challenge Anarchy mode	The Art of Destruction Unleash over-the-top kills by mixing fast-paced gunplay with unique kick, slide, and leash combos with Bulletstorm’s distinctive ‘Skillshot’ system that rewards creative carnage MODES	Campaign	Battle your way through throngs of Stygia’s mutated inhabitants, performing masterful kills throughout the single-player campaign using Bulletstorm: Full Clip Edition’s unique “Skillshot” system that rewards you for executing the most creative and deadly kills imaginable Overkill Campaign Complete the single-player campaign to unlock the cranked-up, unrestricted ‘Overkill’ Campaign Mode that provides unfettered access to all weapons and Skillshots starting from Act 1	Anarchy Co-op 4X the players and 4X the carnage! Shatter score goals as a squad of four by taking down 20 waves of enemies in 12 maps, performing Team Skillshots and unleashing the glorious Blood Symphony Skillshot along the way Echo	Kill with skill and climb the leaderboards across 30 Echo Mode challenge maps where your score is only limited by your kill-a-tivity System RequirementsWindows - MinimumOS: Windows 7/8/8.1/10 x64Processor: AMD A8-3850Memory: 6 GB RAMStorage: 15 GB available spaceGraphics: Radeon HD 6850DirectX: Version 11Network: Broadband Internet connectionSound Card: DirectX Compatible Windows - RecommendedOS: Windows 7/8/8.1/10 x64Processor: Intel Core i5-760 / AMD Athlon II X4 645 AM3Memory: 8 GB RAMStorage: 15 GB available spaceGraphics: GeForce GTX 750 Ti / Radeon HD 7770DirectX: Version 11Network: Broadband Internet connectionSound Card: DirectX Compatible© 2016 PCF Group Sp. z o.o., People Can Fly Sp. z o.o. 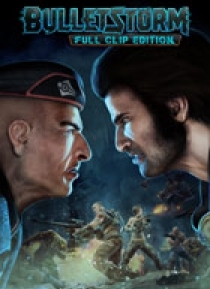 People Can Fly, Bulletstorm and the People Can Fly logos are registered trademarks, and the Bulletstorm logos are trademarks, all used courtesy of People Can Fly Sp. z o.o. Published and distributed by Gearbox Publishing. Gearbox and the Gearbox Software logo are registered trademarks, and the Gearbox Publishing logo is a trademark, all used courtesy of Gearbox Software, LLC.